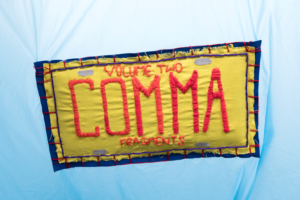 “My time as an intern, at The Comma Project, gave new meaning to the word collaboration for me. My experiences gave me insight into the various practices of active contemporary artists and helped me apply methods of creating, that I had learned in the classroom, to my outside work. The Comma Project is a series of annual boxed collections of small art objects that is inspiring collaboration between artists from all over the country. My tasks as an intern were to aid in assembling “Fragments, Volume 2” and helping to create pieces of art for the launch party and pop-up show, that took place in September. I participated in creating large inflatable structures, embroidery pieces, and tote bags. I learned new methods of creating such as laser printing and screen printing. I was fortunate enough to experience various aspects of the collaboration between my supervisors; from materials and methods to organizational details about the collaborative. I saw the dedication and hours that the artists put into their work, in addition to the effort that they put into teaching courses at Florida State University. While I was taking my Foundations courses, I was assigned a group project. The project was to create an inflatable structure made out of plastic bags, using only a clothing iron and parchment paper. The activity pushed me out of my comfort zone and challenged me to think about art in a three-dimensional way which was new to me at the time. The second time around at The Comma Project, I was challenged yet again, but I was able to get more comfortable with three-dimensional art and was able to understand how inflatables operate more thoroughly. My supervisor and I worked to create an inflatable structure that was a large-scale replica of one of the items that are in the boxed collection. I was able to put skills that I had learned throughout undergraduate school into action. The Comma Project introduced me to group collaboration and broadened my horizons. It showed me new methods of creating and with new mediums to create. I learned time management by balancing studio time with class work and personal time.